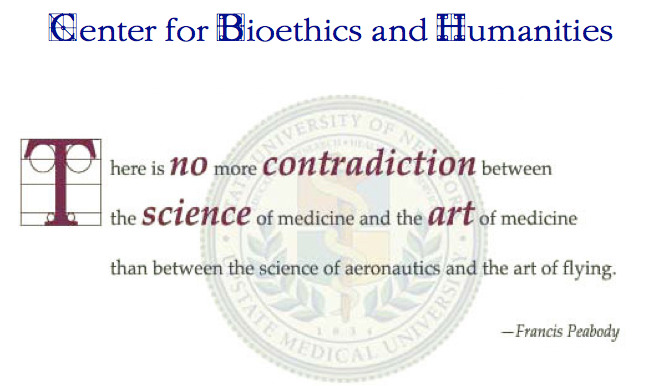 The Center for Bioethics and Humanities, a department of the College of Medicine, advances the scholarly and professional understanding of bioethics and the medical humanities. Ultimately, our goal is to promote health care and health policy that is patient centered, compassionate, and just. We provide education to learners in all of Upstate's Colleges and at University Hospital, publish a wide range of scholarly work and a literary journal, and provide clinical clinical ethics consultation at University and Crouse Hospitals. Explore our website to learn more or drop by our office on the northwest corner of Adams and Irving. Last Modified: August 08, 2018. Contact Jessica Barbuto with questions about the content of this page.